The collapse of America’s largest University isn’t good…it’s great! It really is a wonder what makes a news cycle. A few dozen Muslims get killed by a Leftist lunatic in New Zealand, and it’s all over the US news, and they can’t even get the political affiliation of the self-proclaimed terrorist right. Meanwhile, about a dozen Christians are killed every day just for being Christians…and not a peep. 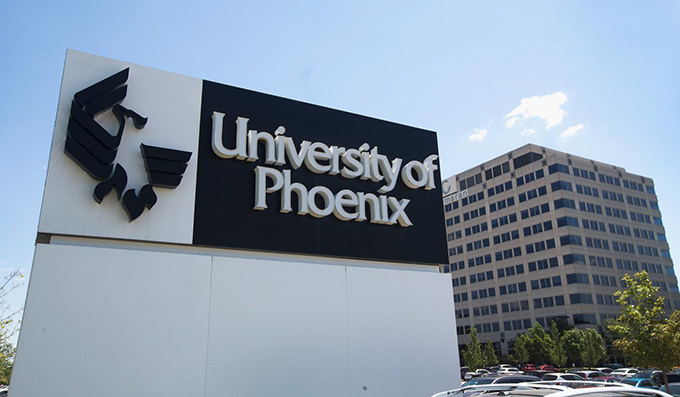 Stumbling over to higher ed, I want to talk about the nation’s largest university: University of Phoenix. These guys used to be relentless with their ads, although they still advertise on TV quite a bit (as an aside, I wonder if the next generation will even know what “TV” stands for…”a streaming service where you can’t completely control what you watch or when you watch it? No way it existed!”). College enrollments have been falling nationwide. Most of this drop is at the for-profit schools, and for good reason: while degrees in general are grotesquely overpriced, for-profit degrees are extra excessively expensive. Revenues at UoPhoenix are down about 60%, leading to many firings of teachers and staff (unlike state schools, a for-profit will actually fire staff when revenues fall). Before moving back to the media silence on this “catastrophe,” I want to explain a bit what’s happening at University of P.
One of the problems of schools of this size is the economy of scale when it comes to cheating. Back when classes were small, it was tough to find someone to do your homework for you, particularly in the advanced courses. I mean, sure, you could someone to do “College Algebra” easily enough, and Calculus 1 wasn’t so bad…but by the time you get to multivariate calculus or third year statistics? Well, the people that could be tutors for that are either teaching, or working jobs in the real world. To hire them to do your work, you’d have to pay real money and plenty of it, because the work your class has assigned only applies to the people in your class…labor intensive for an already established professional, and he’ll charge for it. But UoPhoenix standardizes everything, so now you’ve got a thousand or more people taking a class, the same class every semester with the same assignments. One guy can do the work, and sell it to dozens of students, lowering the cost…assuming it’s not just PowerPoint/multiple choice stuff. I’ve seen sites selling the answers/coursework for the entire UoPheonix catalogue for amazingly low prices. And here’s what happened: the whole point of UoPhoenix was to supply degrees so people could get better jobs. Noble enough, and it happened. But now management, with such degrees, knows those degrees are bogus, and warns their own employees away from them, as well as doesn’t hire such degrees. University of Phoenix made quick, massive, bucks from the student loan scam, but because they prioritized profits over integrity, quantity over quality, they’re now imploding, bringing down other “for-profit” schools with them. But there is no story, so far, in the news about the collapse of America’s largest university, because confirmable information is difficult to obtain. The University of Phoenix media room does not return calls or emails. And the culture of silence at the school prohibits the truth from coming out. To be fair, the “culture of silence” is hardly unique to University of Phoenix, as the constant stream of scandals from our other universities, revealed after years of protection via silence, indicates. But in any event, this is our nation’s biggest university, and it’s failing, failing hard. It was founded in 1976, before the student loan scam became integral to higher ed, but once that student loan money became available it engorged itself more than any other school (and that’s not a low bar by any means!). It’s now dying, and the gluttony which allowed it to reach such size is as much a factor here as it is for a 600lb human dying of heart disease. In 2007, the limitations of online education, the adjunctification of labor, and the University of Phoenix became more evident in a New York Times article that revealed the school’s subprime graduation rate. It wasn’t just the fraud which killed it, as the very loose rules which allowed student loans permitted the school to enroll basically anyone with opposable thumbs, raking in the student loan money from “students” who had no interest in academics and no chance of ever completing a degree program. In a scheme called “The Matrix”, enrollment representatives were rewarded for meeting enrollment numbers. And with that, enrollment representatives would do almost anything to get asses in classes. Apollo Group’s CEO Todd Nelson took the school to its highest numbers. But these numbers would come at a cost. The school faced enormous pressure from federal and state agencies. I again point out UoPhoenix is hardly alone in such a business model. The Federal government is now dimly aware that there’s something wrong with the student loan scam, and I’m confident it will soon be squinting at quite a few other schools with identical business practices. This is what worries me about the media silence here. Yes, University of Phoenix was the 600lb gorilla, and it’s now dying. But across the country we have plenty of schools, not just for-profits, not just for-profits disguising themselves as non-profits (an ever more common tactic…I don’t think it’ll work), but even state-run schools, which did and do many of the same things University of Phoenix did and does. If there was a bit more coverage of this collapse, perhaps they’d have more chance to straighten up their act. I know, that’s foolish, as the people looting our schools and student loans will probably just take golden parachutes rather than suddenly develop integrity…but I think the effort should be made, nonetheless. I got an Associates Degree in IT, focusing in Web Design, through their Online classes. My degree isn’t worth the paper it is printed on. I didn’t learn anything really useful, and when I got my degree is when GoDaddy got really big within the next year, so I wasn’t able to get a job making websites. I wondered why some of my classmates were still in school. I had one group project where one group member literally copied and pasted his entire section. He didn’t see anything wrong with that. The other group members said to leave it even though it was a group grade. I redid his section before submitting it, letting the teacher know what happened. The student was not kicked out or even suffered anything more than a bad grade on that one assignment. Many classmates couldn’t use the spell check built into the class board, even though the first class, which was mandatory, was showing how to use everything including the spell checker. Yes, the above comes from a ‘Phoenix student but…plenty of students at other schools can tell similar stories, and I’ve been at schools where, absolutely a student who cheated at this level would barely have a penalty for being caught. The reason of course, is teachers who punish cheaters get penalized, as I’ve documented before. When America’s largest university shutters its doors, we’ll have yet another big mess…why does it need to be such a surprise to the American people when this happens?